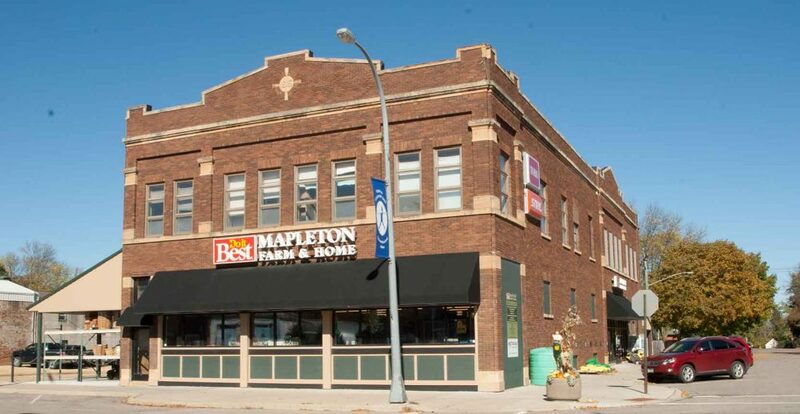 Mapleton Farm & Home is conveniently located in the heart of downtown Mapleton. Built in 1915, the store has undergone a number of transformations over the years. But one thing has remained constant, the value and service provided to all customers. After extensive renovations in 2014, Mapleton Farm & Home opened as a Do it Best retailer, serving communities and businesses within the entire Maple River area. Jim Heins, a Mapleton-area farmer and businessman, is responsible for the recent upgrades to the store, as well as its success. Jim, his wife Betsy and an eager team of associates serve customers 7 days a week, in a beautiful state-of-the-art facility. Mapleton Farm and Home has a definite focus on agriculture, providing area farmers with everything from replacement parts to traditional hardware needs. Livestock, equine and pet supplies are plentiful. For the homeowner, Jim and Betsy’s team have do-it-yourself supplies, a paint center, automotive supplies, housewares and more. Mapleton Farm and Home continues the tradition of bringing quality, value and convenience to the community. We’re proud of the staff we have on board to serve you!